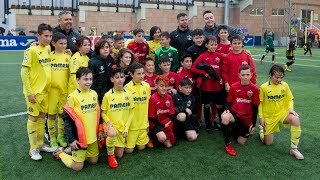 Villarreal pulled out all the stops in their game this weekend, in the Santo Domingo stadium, when the Submarines won a well deserved victory against Alcorcón (1-3). This win brought them back in to the runnings for promotion. The Yellows had an incredible first half thanks to goals from Uche and Bruno, and the second half was secured by an incredible goal from Tito Canteros. Following their victory, Villarreal is now in third place in the Segunda Liga (drawing with Alcorcón and Almería). 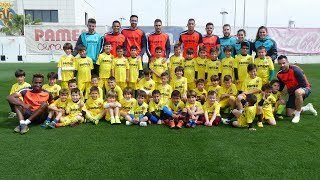 This makes next weeks game even more important as Villarreal will be facing the team in second place; Girona (at home in El Madrigal, Saturday the 18th, 8pm). Conscious of the importance of the game, the Yellows started the game as a battle of tactics. The locals were looking for quick transitions, but Villarreal managed to maintain their discipline and started to look for gaps in Manu Fernández's defence. In the 7th minute, the Submarines were rewarded for their efforts when, during a corner, Uche made the most of some confusion in the area after a shot from Fernando Sales rebounded off the goal and into the path of Uche, who then found the back of the net. The Yellows were the first on the score board; 0-1. The game was going Villarreal's way, but there was still an eternity left to play. The goal galvanised Alcorcón into action, who knew they needed to take control of the game if they wanted to stay in the runnings for promotion. Villarreal however, held their ground. 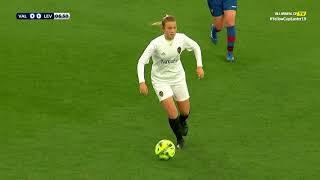 They focused on not making mistakes that the opposition could take advantage of, while still applying pressure of their own and creating danger where they could; Aquino and Cani quickly gave Alcorcóns defenders plenty to worry about. In the 36th minute, after the team had worked the ball up the pitch, Canteros took a perfect corner which found Bruno on the second line, who headed the ball of a rebounding shot that hit the crossbar. After a brief brake Perbet had a great opportunity to add his name to the score sheet while taking advantage of a mixup in defence, however, Manu Fernandez managed to save the strike made by the French man. 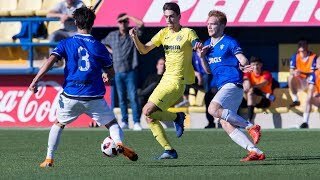 After Villarreal's two goals, Alcorcón tried to reset the balance by taking control of the ball, but the Yellows did not crack under the pressure. They concentrated their defence, and tried to keep the opposition outside of their defensive third and when they did manage to penetrate through, Juan Carlos deftly denied their attempts on his goal. The fight, therefore was mainly contained in the midfield. In the 65th minute, Perbet tested the Alcorcón goalie but his attempt was quickly rejected by Manu Fernandez. Three minutes later the home team had the next best opportunity on goal, Sergi Enrich received a feed in the area practically in front of Juan Carlos, but the Mallorcan failed to turn his great opportunity into a goal. There was just under half an hour left when Alcorcón, who had been dominating possession, narrowed the difference between the two teams. From a cross from the wing, Sergi Enrich got around his marker and with a header made the score 1-2. The home team was back with a fighting chance. After that goal Alcorcón made it their mission to find a chink in Juan Carlos' armour, or failing that, to find a foul near the area that would give them an opportunity to equalise with Villarreal. The game gathered pace and emotions were running high, but Villarreal refused to continue suffering. Alcorcón kept forging forward and testing Juan Carlos but, from these attempts, Villarreal found some strength. Shortly after this, Tito Canteros received a long pass in front of the area, found his composure and beat three defenders to score an incredible goal that ended Alcorcón's hopes for a draw. The game finished on 1-3 to Marcelino's men who were certainly back in the running for promotion.